Still unmarked by construction activity Sunday: The I-5 northbound off-ramp on the Jefferson Highway. It takes a while to get legions of ODOT officials to sign off on the details of work on the highway system, which explains why nothing has yet happened on construction of a Love’s truck stop in Millersburg. But the wait is due to end next month. 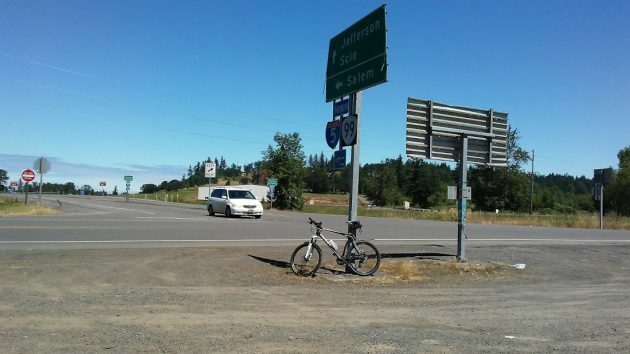 ODOT required improvements at the northbound ramps on I-5 and the Jefferson Highway before allowing Millersburg to approve the truck stop near the freeway on Old Salem Road. Agreement was reached in February, allowing the plans to proceed. Sunday I rode my bike out there to see if anything was going on. There was no sign of any impending road construction. 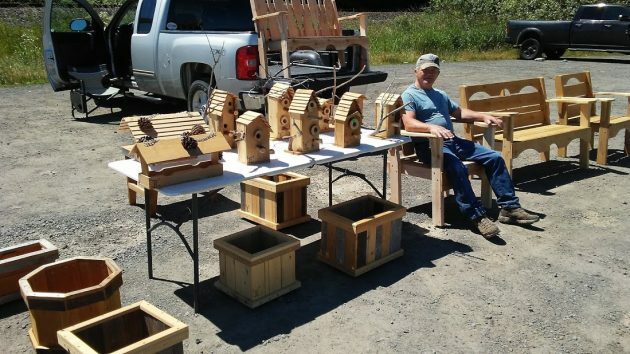 But I did meet Tom Roebke, a Marine Corps veteran of the Vietnam War who had set up in the gravel lot opposite the ramps with an array of his nicely made wooden yard furniture and bird houses. As for the highway work, the plans submitted by SCJ Alliance of Lacey, Wash., had to be reviewed and approved by ODOT engineers and officials in sections dealing with — take a deep breath — bridges, utility permits, maintenance, environment, geotech, hydraulics, pavement, right of way, signals, signing, striping, traffic analysis, traffic control, illumination and roadways. A spread sheet forwarded to the city of Millersburg says most of the reviews are complete. The highway work consists of a left turn on Jefferson Highway to get on the freeway northbound, a left and a right turn lane on the northbound off-ramp, all-way stop signs and other items. All must be completed before Millersburg can grant occupancy permits for the truck stop to be built just west of the freeway. City Manager Steven Hasson reports that Millersburg’s engineers have been doing final reviews of the Love’s project itself to make sure all of the planning commission’s conditions are met. “My understanding is that the groundbreaking is slated for July 18,” he writes. Tom Roebke sits among his merchandise Sunday just off the Jefferson Highway.